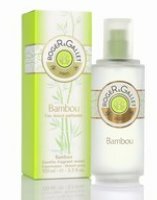 Roger & Gallet has launched a new trio of light fragrance waters: Bambou, Rose & Vanille Eau Parfumèe Douce. Bambou Eau Parfumèe Douce (shown) ~ inspired by the bamboo of Yunnan. The notes include grapefruit, bergamot, tangerine, fig leaves, nasturtium, bamboo, musk, cedar and vetiver. Rose Eau Parfumèe Douce ~ inspired by the roses of Nepal. Additional notes include tangerine, peony, amber and almond milk. Vanille Eau Parfumèe Douce ~ inspired by vanilla from Madagascar. Additional notes include grapefruit, bergamot, tangerine, lily of the valley, tiare, orange blossom, sandalwood and patchouli.